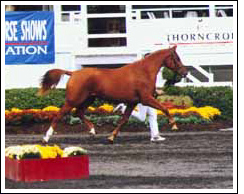 Noblesse is a Provisional Keur mare, and was the NA/WPN #1 Main Foalbook 2 Year Old in North America at the 1997 keurings. Noblesse was shown at Third level during the 2002 season. 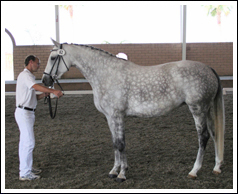 MATURE HORSE - BRED MARE. 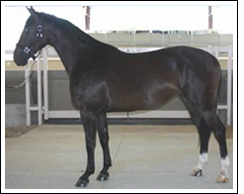 Congratulations to Barbara and Bill Baronas of Sunrise Beach, Texas on their purchase of Raquel DG. British Columbia on her purchase of Scandalous Elite Sport. 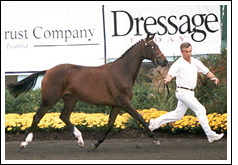 Willy Arts and DG Bar Ranch on the purchase of Vittoria SVS Keur. Stephanie and Jon Haggard of Lecompton, Kansas on their purchase of Voila! 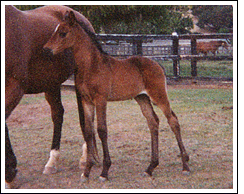 FR, an elegant 2002 dark bay filly by VDL Orame. 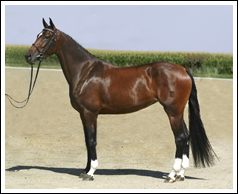 of Yucaipa, California on her purchase of Zegna FR, a black filly by Sandor-Jane, the 2003 USDF National Champion Mature Stallion, and out of the 2003 USDF National Champion Broodmare, Raquel DG.